Luteinizing hormone secreted by the anterior pituitary gland regulates gonadal function. Luteinizing hormone secretion is regulated both by alterations in gonadotrope responsiveness to hypothalamic gonadotropin releasing hormone and by alterations in gonadotropin releasing hormone secretion. The mechanisms that determine gonadotrope responsiveness are unknown but may involve regulators of G protein signaling (RGSs). These proteins act by antagonizing or abbreviating interaction of Gα proteins with effectors such as phospholipase Cβ. 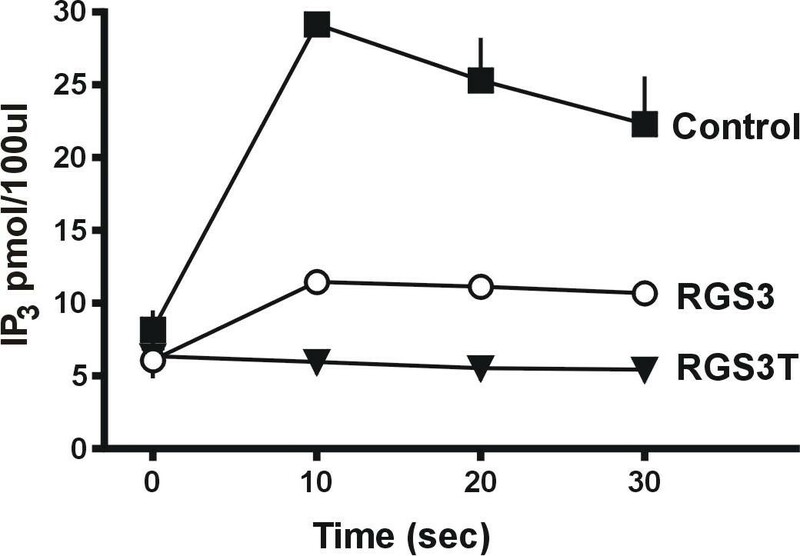 Previously, we reported that gonadotropin releasing hormone-stimulated second messenger inositol trisphosphate production was inhibited when RGS3 and gonadotropin releasing hormone receptor cDNAs were co-transfected into the COS cell line. Here, we present evidence for RGS3 inhibition of gonadotropin releasing hormone-induced luteinizing hormone secretion from cultured rat pituitary cells. A truncated version of RGS3 (RGS3T = RGS3 314–519) inhibited gonadotropin releasing hormone-stimulated inositol trisphosphate production more potently than did RSG3 in gonadotropin releasing hormone receptor-bearing COS cells. An RSG3/glutathione-S-transferase fusion protein bound more 35S-Gqα than any other member of the G protein family tested. Adenoviral-mediated RGS3 gene transfer in pituitary gonadotropes inhibited gonadotropin releasing hormone-stimulated luteinizing hormone secretion in a dose-related fashion. Adeno-RGS3 also inhibited gonadotropin releasing hormone stimulated 3H-inositol phosphate accumulation, consistent with a molecular site of action at the Gqα protein. RGS3 inhibits gonadotropin releasing hormone-stimulated second messenger production (inositol trisphosphate) as well as luteinizing hormone secretion from rat pituitary gonadotropes apparently by binding and suppressing the transduction properties of Gqα protein function. A version of RGS3 that is amino-terminally truncated is even more potent than intact RGS3 at inhibiting gonadotropin releasing hormone-stimulated inositol trisphosphate production. A near-universal feature of cell signaling via seven transmembrane, G protein-coupled receptors is attenuation of a cellular response upon prolonged exposure to an extracellular stimulus . This desensitization process is well-established for GnRH-stimulated LH secretion from pituitary gonadotropes [2, 3], and occurs after about 6 h of continued exposure to GnRH in rats ; removal of GnRH permits recovery from the profound suppression of LH secretion, albeit rather slowly (2–4 days; 4). The molecular mechanisms involved in GnRH-induced desensitization are poorly understood, but they do not appear to be due to alterations in GnRH receptor expression [5, 6] or to changes in LH concentrations in the pituitary gland [7, 8]. Earlier, we presented evidence that a regulator of G protein signaling, RGS3, might participate in the regulation of GnRH receptor signaling . The mechanism of RGS action is antagonism of the Gα protein either by accelerating its hydrolysis of GTP, thereby prematurely terminating signaling due to reassociation of the Gα and Gβγ complexes , or by antagonizing interaction of the Gα protein with its effector such as phospholipase Cβ [11, 12]. A large number of RGS genes have been identified in mammals based on the presence of a 120 amino acid core domain [13–16]. RGS proteins have been described that interact with the Giα and Gqα members of the G protein family [17–21]. Previously, we showed that RSG3 was expressed endogenously in rat pituitary cells and, when experimentally co-expressed together with GnRH receptors in a heterologous cell line (COS1), it suppressed GnRH-stimulated inositol trisphosphate production . Here, those studies have been extended to include GnRH-stimulated LH secretion using adenovirus-mediated gene transfer of RGS3 complementary DNA into normal rat pituitary gonadotropes. RGS3 was found to profoundly inhibit GnRH-stimulated LH secretion and 3H-inositol phosphate accumulation. However, a calcium ionophore stimulated LH secretion in RGS3-expressing gonadotropes, confirming a specific site of action occurring at phospholipase Cβ or earlier in the signal transduction pathway. The initial experiments were performed to confirm our earlier finding that RGS3 suppressed GnRH-stimulated IP3 production in COS-1 cells  and to test a truncated form of RGS3, RGS3T (RGS3 314–519)  for suppressive activity in the same assay (Fig. 1). cDNAs representing the GnRH receptor and RGS3 or RGS3T were co-transfected into COS-1 cells for GnRH-A treatment 72 h later; intracellular IP3 concentrations were measured at 0, 10, 20, and 30 sec after addition of 10-7M GnRH-A (Fig. 1). As expected, RGS3 exerted a profound suppression of IP3 production at each of the time points during the 30 sec after agonist treatment (p < 0.05) (Fig. 1). RGS3T is comprised primarily by the consensus RGS domain and was originally reported to decrease the growth rate of yeast and to inhibit IL-8 receptor mediated activation of MAP kinase by a factor of 3–10 fold as compared to RGS3  and was subsequently reported to be a normally expressed variant of RGS3 . Therefore, we compared it to RGS3 for attenuation of GnRH-stimulated IP3 production in COS-1 cells (Fig. 1). As reported by others [24, 37], we found that RGS3T was more potent than RGS3 (p < 0.05) (Fig. 1). Identification of a C-terminal 205 amino acid variant of RGS3 that has equal or greater potency than the full-length 519 amino acid RGS3 will facilitate the identification of RGS3 functional protein domains that are important for its activity. 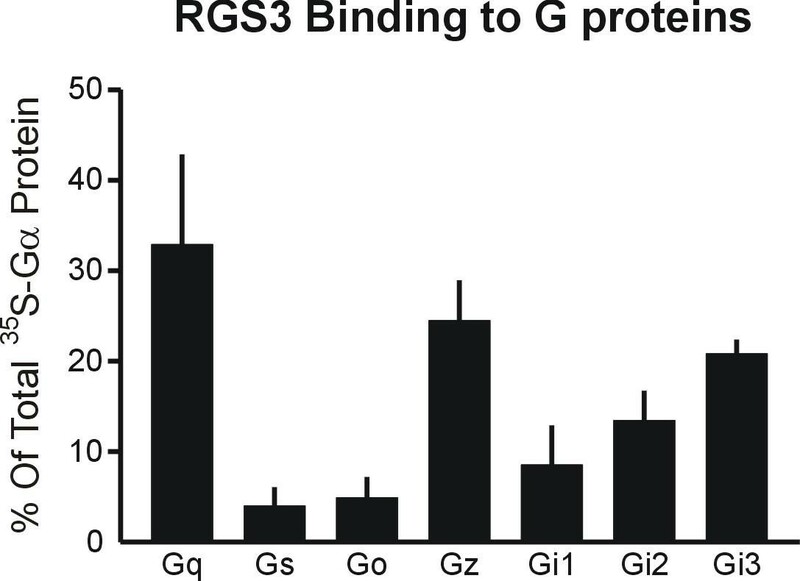 RGS3 and RGS3T suppress GnRH-stimulated IP3 concentrations in COS-1 cells. The cells were co-transfected with cDNAs representing the GnRH receptor and RGS3 or RGS3T; 72 h later the cells were treated with 10-7M GnRH for 0, 10, 20, or 30 sec before being collected for IP3 measurements using receptor radioassay in which IP3 and 3H-IP3 competed for binding to IP3 receptors prepared from calf cerebellum. Data presented are the mean ± SEM of three independent experiments. The SEM is not shown for some data points because it was smaller than the symbol. The RGS3 and RGS3T groups are significantly lower than the control group (p < 0.05), and the RGS3T group is significantly lower than the RGS3 group (p < 0.05). The family of RGS proteins are established to interact with various Gα-protein subunits, thereby antagonizing their activities [13–18, 24]. Indeed, we previously reported that RGS3 bound Gqα , the G protein subunit that mediates GnRH receptor signaling . Here, we have extended those binding studies to include other Gα proteins (Fig. 2). An RGS3-GST fusion protein was incubated with an 35S-Met-Gα-protein, and the amount of labeled Gα-protein was determined using glutathione-coupled beads to "pull down" the RGS3-GST/35S-Gα-protein complex that was then separated and quantified by SDS/PAGE (Fig. 2). More Gqα was bound by RGS3 than any other protein, although its binding was not significantly different from that of Gzα and Giα (p > 0.05). Significant (p < 0.05) amounts of Gi2α, Gi1α, Goα, and Gsα also were bound but were not as high as Gqα, Gzα, and Gi3α. These results confirm our previous findings that RGS3 interacts with Gqα but also show that it has significant interaction with all other Gα-proteins studied. In vitro binding of RGS3 to Gα proteins. An RGS3-GST fusion protein was incubated with 35S-Met-Gα proteins, and glutathione beads were used to "pull-down" the RGS3-GST/Gα protein complex. The amount of 35S-Gα protein bound was determined by SDS/PAGE separation, and quantification using a Phosphor imaging device. The data point for each G protein is the fraction of its total cpm that were bound to RGS3-GST fusion protein after subtraction of the cpm bound to control GST fusion protein. Mean ± SEM of three independent experiments. Gqα, Gzα, and Gi3α were not significantly different from the other Gα-proteins (p < 0.05) that, in turn, were significantly higher than a group to which 35S-Met alone was added (p < 0.05). The findings of the current, and an earlier study , demonstrate clearly that RGS3 suppresses GnRH receptor signaling in a heterologous cell system. Because of the evidence that the signal transduction pathway for GnRH in gonadotropes involves the GnRH receptor, Gqα, phospholipase Cβ, and cellular IP3 release [39, 40], we determined the effect of RGS3 on GnRH-stimulated LH secretion using adenoviral-mediated gene transfer in rat pituitary cells (Fig. 3). In these experiments, we performed a dose-response test that included three experimental groups: uninfected, adeno-β galactosidase, and adeno-RGS3 infected. Adeno-βgal infection was used for determination of the fraction of cells infected at each dose of virus (Fig. 3, top panel) and as a control for the effects of adeno-RGS3 on GnRH-stimulated LH secretion (Fig. 3, middle panel). Cell viability, measured as trypan blue exclusion, varied from 98.5–100.0% (Fig. 3, top panel). The fraction of cells infected by the adenovirus depended on viral dose (0–5.0 M.O.I. ; 1 M.O.I. = 1 viral particle/pituitary cell) and ranged from about 2% (no adenovirus) to 99.5% (5.0 M.O.I.). Adeno-βgal had no effect on LH secretion at any dose compared to the uninfected group (Fig. 3, middle panel). In contrast, an inverse dose-related effect was observed between adeno-RGS3 and GnRH-stimulated LH secretion (Fig. 3, bottom panel). RGS3 0.2 M.O.I. was the lowest dose to inhibit LH secretion (p < 0.05), and 2.0 and 5.0 M.O.I. exerted near complete inhibition of LH secretion; i.e. LH concentrations in these two latter GnRH-treated groups did not differ from their cohort controls (p > 0.05). RGS3 inhibits GnRH-stimulated LH secretion. Rat anterior pituitary cells were infected or not with adeno-βgal or adeno-RGS3, and 72 h later treated with GnRH to stimulate LH secretion. Upper panel: Adeno-βgal infection was used to determine the fraction of total pituitary cells infected at each dose of adenovirus. Cell viability was measured as trypan blue exclusion. Middle panel: Adeno-βgal infection at various doses was used to control for the effect of RGS3 on GnRH-stimulated LH secretion. No dose of adeno-βgal had an effect on LH release (p < 0.05). Bottom panel: Dose-response relationship between dose of adeno-RGS3 and GnRH-stimulated LH secretion. Adeno-RGS3 doses of 0.2 M.O.I. and higher significantly inhibited LH release (p < 0.05); doses of 2.0 and 5.0 M.O.I, suppressed LH secretion to levels that were not significantly different from their cohorts not treated with GnRH (p < 0.05). Data are mean ± SEM of three independent experiments. The profound inhibition of GnRH-stimulated LH secretion observed in Fig. 3 required verification that RGS3 expression was induced by adeno-RGS3 infection. 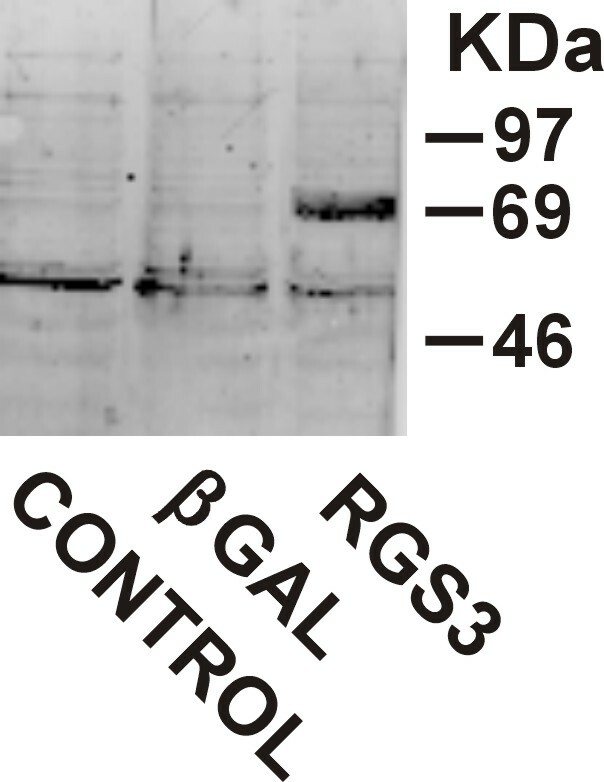 To address this issue, we performed RGS3 immunoblots (Fig. 4) which showed an increase in RGS3 protein expression in adeno-RGS3 (5.0 M.O.I.) infected pituitary cells as compared to low to negligible levels of protein in the uninfected and adeno-βgal infected groups. One immunoblot representative of 2 showing RGS3 expression in rat pituitary cells that remained uninfected (control) or were infected with 5 M.O.I, adeno-βgal or of adeno-RGS3. The ~70 kDa band is RGS3 (24); the bands at ~54 kDa are non-specific because they appear in all 3 lanes. As evidenced earlier, the molecular locus of RGS protein action is thought to be the G protein α subunit, specifically Gqα in the case of GnRH receptor activation. The results shown in Fig. 5 are consistent with this conclusion: adeno-RGS3 infection of rat pituitary cells profoundly suppressed GnRH-stimulated 3H-inositol phosphate accumulation. These results are compatible with a molecular site of action for RGS3 being at phospholipase C or earlier in the signal transduction pathway. 3H-inositol phosphate accumulation stimulated by GnRH was inhibited by RGS3. Pituitary cells were infected with adeno-βgal or adeno-RGS3 (5 M.O.I.) and 72 h later were treated with GnRH agonist (10-7 M for 1 h). Data presented are the means ± SEM (n = 4). The letter a above the results of the treatment groups indicates that a group is not statistically significantly different (p > 0.05) from its control whereas the letter b indicates difference (p < 0.05) from its control group. Another experiment conducted to test the specificity and molecular locus of RGS3 action in inhibiting GnRH-stimulated LH secretion was treatment of adeno-RGS3 infected cells with an agent that increases intracellular calcium (Fig. 6). Calcium is an established stimulator of LH secretion that is thought to act at sites downstream of phospholipase C [39, 40]. Therefore, adeno-RGS3 infected pituitary cells were treated with a calcium ionophore (A23187). 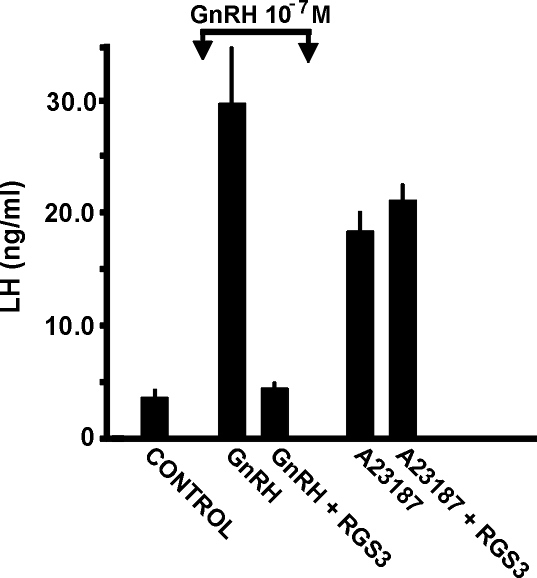 Adeno-RSG3 inhibited LH secretion in the GnRH-treated control group as expected (Fig. 6). However, the calcium ionphore stimulated LH secretion in RGS3-expressing gonadotropes (Fig. 6), an effect that would be expected if the RGS3 inhibition was exerted at the level of the Gqα protein. Calcium influx stimulated LH secretion in rat pituitary cells expressing RGS3. Calcium influx was achieved by calcium ionophore (A23187) treatment (100 μM for 3 h) of pituitary cells infected with 5 M.O.I, of adeno-RGS3. Adeno-RGS3 significantly inhibited LH secretion stimulated by GnRH (p < 0.05) but not by calcium ionophore (p > 0.05). In two final control studies, we investigated the effect of adeno-RGS3 on LH concentrations in pituitary cells and on GnRH receptor binding (Fig. 7). In neither case did RGS3 affect these parameters of gonadotrope function (p > 0.05). Effect of RGS3 on LH content and GnRH receptor binding. Pituitary cells were infected or not with adeno-RGS3 or adeno-βgal (5 M.O.I.) and 72 h later were used for measurement of LH content or of GnRH receptors. Upper panel: LH content of pituitary cells was measured after repeated freezing and thawing to release LH for measurement by RIA. There were no significant differences among the groups (p > 0.05). Lower panel: Pituitary cell membranes were prepared for measurement of GnRH receptors by binding to 125I-GnRH-A. There were no significant differences among the groups. Our earlier report that adeno-βgal (60 M.O.I.) increased receptor binding by 100% (23) was not observed here because of the lower dose of adeno-βgal (5 M.O.I.) used. Data are mean ± SEM of three independent experiments. The quantity of LH secreted by the anterior pituitary gland is the outcome of an interaction between the amount of hypothalamic GnRH secretion and the level of gonadotrope responsiveness to GnRH . Quantitatively, gonadotrope responsiveness is more important than the level of GnRH secretion; for example, during the estrogen-stimulated preovulatory surge of LH secretion in the rat there is a 5-fold increase in GnRH secretion but a 50-fold increase in LH secretion . Moreover, a quantity of GnRH that will evoke a normal preovulatory LH surge during the period preceding ovulation will induce only a small increase in LH secretion at other stages of the estrous cycle . Similarly, termination of the preovulatory LH surge appears to be due to desensitization of the gonadotrope to GnRH action; in the sheep, a decrease in LH secretion precedes the decrease in GnRH secretion , whereas in the rat, although the decrease in GnRH and LH secretion are co-incident , there is evidence that the gonadotrope is already desensitized to GnRH [42, 43]. The mechanisms that alter gonadotrope responsiveness to GnRH are unknown but they do not appear to be due to GnRH receptor number or LH stores in the pituitary gland [5–8]. However, the fraction of LH that is released by a maximal dose of GnRH does vary positively with gonadotrope responsiveness , and elucidation of the mechanisms altering the fraction of releasable LH is likely to illuminate mechanisms of gonadotrope responsiveness to GnRH . Two molecular loci recently have been implicated as potential modulators of GnRH receptor signaling: one is the receptor itself , and the other is the G protein that transduces the signal generated by binding of the receptor to its agonist . With respect to the former locus, G protein coupled receptor kinases (GRKs) act in an agonist-specific manner to phosphorylate intracellular regions of the receptor thus permitting β arrestin binding that sterically inhibits G protein association with the receptor [1, 45]. We have reported previously that experimental expression of GRKs in GnRH receptor-expressing heterologous cells (COS-1) suppressed GnRH-stimulated IP3 production, and that co-expression of GRK2 and β-arrestin 2 suppressed GnRH receptor signaling more than that of either alone . Stronger evidence that the GRK/β arrestin paradigm may play a role in regulating GnRH receptor signaling is our recent finding that adenovirus-mediated gene transfer of GRK2 into normal pituitary gonadotropes suppressed GnRH-stimulated LH secretion and IP3 production . However, no evidence has been presented for a direct interaction between β-arrestin and the GnRH receptor. With respect to the G protein as a locus for modulation of GnRH receptor signaling, we reported earlier that experimental expression of RGS3 but not RGS1, 2, or 4 in GnRH receptor expressing COS-1 cells suppressed GnRH-stimulated IP3 production . In the current report, we present evidence strengthening the hypothesis of a regulatory role for RGS3 in GnRH receptor signaling: adenovirus-mediated expression of RGS3 in normal pituitary gonadotropes profoundly inhibited GnRH-stimulated LH secretion and 3H-inositol phosphate accumulation. Arguing for the specificity of this effect is the stimulation of LH secretion by a calcium ionophore and the failure of LH stores and GnRH-receptor binding to be affected by RGS3. Moreover, our finding that GnRH-stimulated IP3 production was inhibited supports the locus of the RGS3 effect as residing at phospholipase C or earlier in the transduction pathway, most likely at the Gα protein because of our studies both earlier  and here showing that RGS3 binds Gqα in vitro. Finally, the stronger inhibitory effect of RGS3T than RGS 3 on COS cell function was presumed to be true also for gonadotrope function and therefore was not tested here. The determination of RGS specificity for receptor-G protein pairs are currently unknown; i.e., we and others have found that several RGSs interact with Gqα but only one, RGS3, has potent inhibitory activity on GnRH receptor signaling. For instance, RGS4 and RGS-GAIP , RGS3 , RGS2 , and RGS7 (our unpublished findings) all bind Gqα, the established G protein that transduces GnRH receptor signaling . Nevertheless, RGS2 and 4 , and RGS-GAIP and RGS7 (our unpublished data) are weak or null inhibitors of GnRH receptor signaling. A recent report seems to have clarified this issue: RGS4 must bind not only Gqα but also selected Gq-coupled receptors before it can inhibit receptor signaling [47, 48]. Based on this finding, we propose that RGS3's binding to the GnRH receptor as well as to Gqα accounts for its specific inhibiting of GnRH receptor signaling. The results of the current investigation as well as those presented earlier  nominate two molecular mechanisms as playing roles in setting the responsiveness level of GnRH receptor signaling; i.e., the RGS3 system acts at the G protein transducing step and the GRK/β arrestin system acts at the level of the receptor. Future studies must address whether both, neither, or only one of these mechanisms are physiologically relevant. cDNA representing the rat GnRH receptor was cloned into pcDNA3 as described and validated previously [22, 23]. cDNAs representing RGS3 and RGS3T (RGS3 amino acids 314–519) were cloned into the eukaryotic expression vector, rcCMV, as described . COS-1 cells cultured as detailed before  were co-transfected with GnRH receptor cDNA and RGS3 or RGS3T cDNA using Lipofectamine (Life Technologies, Gaithersburg, MD) , and 72 h later, treated with 10-7 M GnRH-A for 0, 10, 20, or 30 sec before being collected for IP3 measurements [22, 23]. IP3 measurements were performed on COS-1 cell cytosolic preparations using a radioreceptor assay in which IP3 and 3H-IP3 compete for binding to IP3 receptors prepared from calf cerebellum membranes [22, 23]. RGS3 protein fused to glutathione-S-transferase (RSG3-GST fusion protein) was produced in the pGEX-5x-1 system of Pharmacia as detailed previously . 35S-Met labeled Gα-proteins were prepared in vitro using a transcription/translation protocol . cDNAs for Gqα  and Gzα  were obtained from M. I. Simon; for Gsα (ref. No. 63315) and Gi2α (ref. No. 63311) were obtained from the American Type Culture Collection (ATCC); for Gαo  was obtained from Eva G. Neer; for Gi1α,  from G. R. Post; and, for Gi3α  from M. G. Farquhar. Binding studies of recombinant RGS3-GST fusion protein to 35S-Met-Gα-proteins were performed as detailed . Glutathione-coupled beads were used to select 35S-Gα proteins bound to RGS3-GST, and were then eluted for separation by SDS/PAGE . The amount and molecular size of 35S-Gα protein were determined using a Phosphor imaging device (Molecular Dynamics). Recombinant adenovirus containing RGS3 cDNA was prepared using procedures previously described in detail by Becker et al. and by us . Human RGS3 cDNA  was restricted from the pRC/CMV vector with EcoRI, and then subcloned into the corresponding site of the pACCMVpLpa plasmid. The proper orientation of the RGS3 cDNA was confirmed by nucleotide sequencing. The procedure for preparation of the adenovirus was co-transfection of a human embryonic kidney cell line (HEK 293) with the pACCMVpLpa plasmid and another plasmid (pJM17) containing most of the viral genome . A relatively rare recombination of the two plasmids occurs in the HEK 293 cells that reconstitutes the adenoviral genome. The recombination event reconstituting adeno-RGS3 was confirmed using PCR analysis to detect the presence of RGS3 cDNA. Next, adeno-RGS3 was isolated by clonal selection in HEK 293 cells followed by a second PCR to confirm the presence of RGS3 cDNA. Finally, large-scale amplification and titering of adeno-RGS3 was performed in HEK 293 cells. This virus preparation was used for infection of rat pituitary cells . Anterior pituitary glands were obtained from female Charles River CD rats that were maintained in accordance with the NIH Guide for the Care and Use of Laboratory Animals using an experimental protocol that had been approved by the Institutional Animal Care and Use Committee. The pituitaries were dispersed with trypsin as described before . The mono-dispersed cells were plated into poly-L-lysine coated 60 mm plastic Petri dishes in DMEM/10% gelding horse serum containing 10-9 M estradiol to optimize the GnRH-responsiveness of the gonadotropes , and incubated overnight at 37°C in 8% CO2-92% air. Pituitary cells were infected using a volume of adeno-RGS3 or adeno-β galactosidase necessary to achieve the chosen multiplicity of infection (M.O.I.) diluted to 0.3 ml; this was further diluted with 1.2 ml of TS buffer (8.0 gm/L NaCI, 380 mg/L KCl, 100 mg/L Na2HPO4, 3.0 gm/L Tris HCI, 200 mg/L CaCl2· 2H2O, 100 mg/L MgCl2 · 6H2O; pH 7.4). The pituitary cell culture medium was aspirated and replaced with the virus solution, and the cells were incubated at 37°C in a CO2 incubator for approximately 72 h.
Next, the cells were collected by trypsinization and counted using a hemocytometer; then, they were checked for viability using trypan blue . The cells were replated for 2 h at 37°C in DMEM -0.1% bovine serum albumin (BSA) and subjected to x-gal staining for determination of the fraction of cells infected by the virus , or to stimulation by GnRH-A for measurement of LH release. Pituitary cells that had been re-trypsinized 72 h after infection and then replated (100,000 cells/well in a 24-well poly-L-lysine coated plate) for a 2 h preincubation were subsequently treated with a GnRH agonist (1 ml of 10-7M D-Ala6 – des Gly10 – GnRH ethylamide; GnRH-A, Sigma, St. Louis, MO) or a calcium ionophore (A23187, Sigma) for 3 h as described by Conn et al.. The medium was removed and centrifuged at 200 × g for 10 min to pellet any detached cells. The supernatant solution was either used immediately or stored at -20°C prior to RIA. LH RIAs were performed using reagents and instructions provided by Dr. A. F. Parlow on behalf of the National Hormone and Pituitary Program, National Institute of Diabetes and Digestive and Kidney Diseases, NIH. Rat LH (NIDDK-rLH-l-9) was radioiodinated, the LH antiserum (NIDDK-anti-rLH-S-11) was prepared in rabbits, and the reference standard was NIDDK-rLH-RP3. The mean EC50 of the standard curves (n = 10) was 0.59 ng with a coefficient of variation of 4.4%. Total [3H] inositol phosphate accumulation was determined in [3H] myoinositol-labeled pituitary cells as described earlier . At 48 h after infection of the pituitary cells, the incubation medium was removed and replaced with a balanced salt solution (10 mM Hepes, pH7.4, 135 mM NaCI, 4.5 mM KCL, 1.5 mM CaCl2, 0.5 mM MgCL2, 1.0 mM NaH2PO4, 5.6 mM glucose, 0.3% BSA, and 10-9M estradiol) containing 5 μCi of [3H]-myoinositol/ml of medium. After a further 24 h, the pituitary cells were recovered by trypinization, counted, and replated in balanced salt solution (400,000 – 500,000 cells/well in a 24-well plate) for a 2 h preincubation. Then, the cells were stimulated with GnRH-A (10-7M for one hr) in the presence of 5 mM LiCI. [3H]-inositol phosphate accumulation in the cells was then measured using ion exchange chromatography followed by liquid scintillation spectroscopy . An antibody to hexa-histidine-tagged human RGS3T was prepared in chickens. RGS3T  is the carboxy terminal 206 amino acids (a.a. 314–519) of RGS3 and is represented by nt 1227–1847 of RGS3 cDNA (Genbank Accession #U27655). To prepare hexa-histidine amino terminally-tagged RGS3T, we modified RGS3T cDNA  using PCR with primers containing restriction sites (the 5' primer incorporated a Bam HI site, whereas the 3' primer bore an Nde 1 site). The PCR product was then cloned into the pET15b vector which carries an N-terminal Histag sequence followed by BamH1 and Nde 1 cloning sites (Novagen Inc., Madison, WI). The resulting plasmid DNA was nucleotide-sequenced to confirm the presence of RGS3T cDNA. The cDNA was then used to transform E. coli of the BL21(DE3) strain. Protein induction was performed using isopropyl-β-D-thiogalactopyranoside (IPTG) as described by Novagen Inc. Inclusion bodies containing the protein were prepared and then solubized in 6 M guanidine. The Histag RGS3T protein was purified on a Ni2+ resin using a Pharmacia Hi-Trap 1 ml Chelating Column (Pharmacia Biotech, Piscataway, NJ). Antibodies to Histag RGS3T protein were prepared in chickens (Aves Labs, Inc., Tigard, OR). A chicken was injected with 145 μg of RGS3T into the breast muscle on four separate occasions; the first injection was in complete Freund's adjuvant, whereas injections 2–4 were made in a 1:1 dilution of complete and incomplete Freund's adjuvant. One week after the last injection, 6 immune eggs were collected, and the IgY fraction purified from the 6 eggs as well as from 3 pre-immune eggs collected from the same hen. Immunoblots for RGS3 expression in pituitary cells were performed as described previously by us [22, 23]. In brief, rat pituitary cells at 72 h after adeno-RGS3 infection (5 M.O.I.) were collected by trypsinization, homogenized, and a protein determination made. Fifty μg protein samples were heated in SDS-PAGE sample buffer containing β-mercaptoethanol and then electrophoresed on a 10% SDS-polyacrylamide gel. Separated proteins were electroblotted onto nylon membranes (Millipore Corp., Bedford, MA) which were then incubated for 2 h in a blocking solution containing 5% non-fat dry milk in phosphate buffered saline containing 0.02% Tween-20. The primary antibody (chicken IgY, 62.5 μg/ml) was diluted in blocking solution and incubated overnight at 4°C with the nylon membrane. Blots were then incubated for 2 h at room temperature in alkaline phosphatase-conjugated goat anti-chicken IgY (0.1 μg/ml diluted in blocking solution; Aves Labs, Tigard, OR). Color development was achieved by incubating the membrane in substrate [(5-bromo-4-chloro-3-indolyl phosphate-nitrobluetetra-zolium chloride) (BCIP-NBT)]. For LH RIA measurements of cell contents, 1 × 105 anterior pituitary cells infected, or not, 72 h previously with adeno-RGS3 or adeno-βgal were trypsinized and plated for 2 h. LH was extracted from the cells  by removing and discarding the medium and adding 1 ml extraction buffer (150 mM NaCI, 50 mM Tris, 5 mM EDTA, and 1 mM bacitracin, pH 7.4) followed by freeze-thawing twice. After centrifugation, the supernatant was removed and subjected to LH RIA as described above. About 3 × 106 pituitary cells infected, or not, 72 h previously with adeno-βgal or adeno-RGS3 were trypsinized, and cell membranes containing the GnRH receptors were prepared by placing the cells in a Dounce homogenizer (Kontes Co., Vineland, NJ) and disrupting them with 30 strokes of the pestle. The cell membranes were pelleted by centrifugation at 26,000 × g and then resuspended in 10 mM Tris buffer. The GnRH RRA on the membranes was performed as described previously [22, 23]. Cell membranes and 1 × 105 cpm [125I]GnRH-A were incubated at 0°C for 90 min. Nonspecific binding was determined as counts per min bound in the presence of 10-6 M unlabeled GnRH-A. Bound and free [125I]GnRH-A were separated by filtration. The filters were counted by γ-scintillation spectrometry. The results are presented as the mean ± SEM of at least three independent experiments unless indicated otherwise. The statistical tests were one-way or two-way analyses of variance with significant differences (p < 0.05) identified by the Student – Newman-Keuls method. Statistical analysis was performed using Sigma Stat Statistical Software for Windows (Jandel Scientific, San Rafael, CA). Supported by NIH Grant 1-R01-HD 34862.